Teary, big-eyed orphans and a multitude of trashy knockoffs epitomized American kitsch art as they clogged thrift stores for decades. When Adam Parfrey tracked down Walter Keane—the credited artist of the weepy waifs, for a San Diego Reader cover story in 1992—he discovered some shocking facts. Decades of lawsuits and countersuits revealed the reality that Keane was more of a con man than an artist, and that he forced his wife Margaret to sign his name to her own paintings. As a result, those weepy waifs may not have been as capricious an invention as they seemed. Parfrey's story was reprinted in Juxtapoz magazine and inspired a Margaret Keane exhibition at the Laguna Art Museum. And now director Tim Burton is filming a movie about the Keanes called Big Eyes, and it's scheduled for release in 2014. Burton's Ed Wood, starring Johnny Depp, was based upon the Feral House book edited and published by Parfrey about the angora sweater-wearing B-film director. 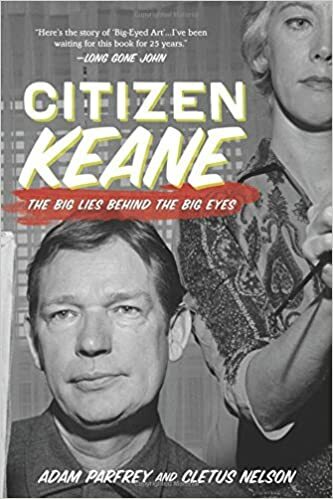 Citizen Keane is a book-length expansion of Parfrey's original article, providing fascinating biographical and sociological details, photographs, color reproductions, and appendices with legal documents and pseudonymous essays by Tom Wolfe inflating big eye art to those painted by the great masters.